This is a port to 1.12.2 (and later, hopefully), of the Hadite Coal module of akkamaddi's Additions from 1.7.10. See that article for original permissions and Minecraft Forum thread links. The mod (an add-on for Simple Ores) was originally written by akkamaddi, and then abandoned; I took up maintenance of the mod after that. However, I am adding a great deal of my own work and code in porting this mod, and I am re-licensing the derived work under the GNU LGPL, which does include an attribution requirement, so it is compatible with akkamaddi's requirement. I have ported Hadite Coal to 1.7.10 (and now 1.12.2). akkamaddi's original documentation copied below; references to older versions removed. Hadite Coal is a noxious, sulphurous, foul-stenched ore of the Nether. While not truly a "coal" , it is similar enough to be so named. The ore itself is native to Netherrack. Due to internal heat, the ore actually glows, though not brightly. Further, when approached, the ore actually spits smoke and embers, making it quite noticeable. Nine pieces of Hadite Coal can also make a Hadite Coal storage block. 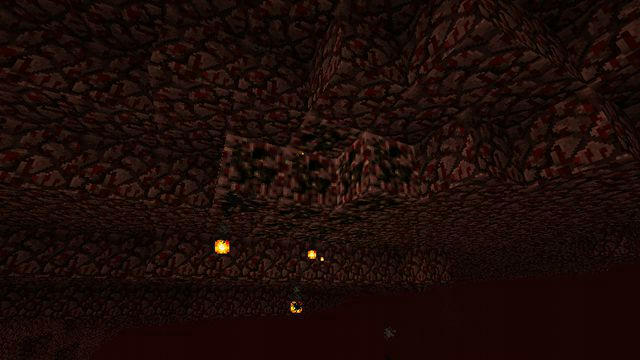 The storage block glows from internal heat brighter than the ore block, but it is not bright enough to be good prevention against mob spawning. 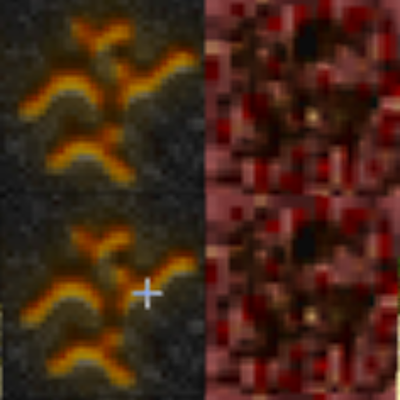 The heat of the storage block makes wisps of flame float around it. The coal block burns for about as long as ten chunks of Hadite Coal, meaning it will burn in a furnace for well over an hour. (New) It can also be used as a permanent fire source, like netherrack, if ignited with flint & steel. In addition to being an excellent fuel, it is used in some recipes. Burning so well, one chunk of Hadite coal will make far more torches than a regular piece of coal. The (shaped) recipe below shows that one piece of Hadite Coal surrounded by eight sticks makes an entire stack of torches. Further, due to the content of sulphur, Hadite Coal can be used in the Fusion Furnace to make gunpowder. If fused with a piece of flint, with a piece of regular coal or charcoal as a catalyst, it will make one pile of gunpowder. It has also been discovered that Hadite Coal can be used to make two alloys. If combined with an Iron ingot, using gunpowder as a catalyst, it makes Hadite Steel. Hadite Steel looks patinaed and corroded due to the sulfur and other noxious substances However, it is surprisingly durable, and so make good tools. Similarly, it can be combined with Tin, catalyzed with coal or charcoal, creating Gestankenzinn. Gestankenzinn looks rusty and corroded, but is more durable than Iron. These recipes create large chunks, which are smelted into ingots. Tool recipes are standard. The materials are not suitable for armor, given that they reek of foul stenches, and similarly the hoes make stunted crops. These enable the particle spawning around storage and ore blocks. They are “true” by default. Changing either (or both) to “false” will disable particles for that block, which may be useful to those with older computers. 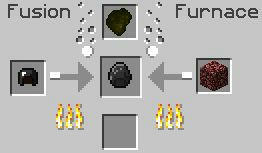 Recycling recipes based on "Simple Fusion Recycle" are incorporated in "Hadite Coal" for the materials in the mod. To enable these recipes, change the Boolean for the entry "enable recycling recipes" from false to true. See the "Recycling" section. The recipes are fairly standard. The used tool is fused with a gravel block, using coal or charcoal as a catalyst. While it is not common knowledge, Hadite Coal is actually a geologic precursor to the Nether gemstone Onyx, in the same way that coal is a precursor to diamond on the surface world. This is why Onyx smells of eggs when it is mined and cut; there are residual sulphur compounds after the heat and compression. (This does not rule out the rumor that ghasts find Onyx tasty, and tend to lick outcroppings when no one is around. This could also contribute to Onyx's funny smell.) Because of the similar chemistry, Hadite Coal can be used as a catalyst when recycling Onyx equipment. 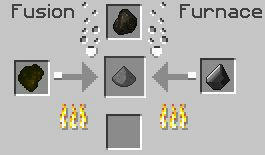 This works the same as the recipes shown in Simple Fusion Recycling, although the Hadite Coal lump replaces a bucket of lava. These recipes add to the recipes in Simple Fusion Recycling; they are not replacements. This does not work for the Onyx alloy Sinisite. Alternate Onyx recycling with Hadite as a catalyst. Are the textures Faithful-style by default? If by "Faithful-style" you mean 32x32, then yes. That was the original developer's (akkamaddi) choice. I'm not a graphics artist and editing textures is not my idea of fun, so I'm sticking with his textures. If anyone wants to donate a 16x16 texture set, I'll post a link to it.